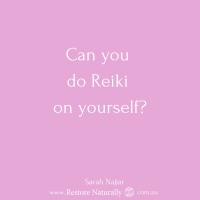 During Reiki Level One, you learn how to practice Reiki on yourself and your friends and family. Your Reiki practice deepens after Reiki Level Two. 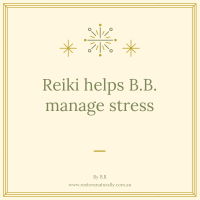 When you practice Reiki on your friends, family and the wider community you, as well as those you share Reiki with, gain holistic balance. So everyone experiences greater health and wellbeing, a quieter mind, and more peace. And here lies one of the many common misconceptions regarding Reiki practice. 1. Different areas of your body are touched, for example, your head, shoulders, abdomen and feet. 2. Hands are hovered above these areas. 2. A deeper connection between you and I. So is Reiki as effective if you or I choose a hands off approach? Absolutely. You still receive the same holistic balancing effects when Reiki is administered hands off. This may be your preferred method. If so, simply let me know during your next session. When I teach Reiki I encourage Reiki students to try both a hands-on and hands-off approach. This helps them to determine which method they feel more comfortable with. 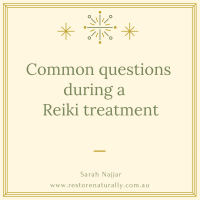 If you practice Reiki professionally or on your friends and family I would be delighted to know which approach suits you and those you treat best. 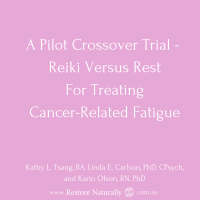 Back to Reiki Articles and F.A.Q’s.